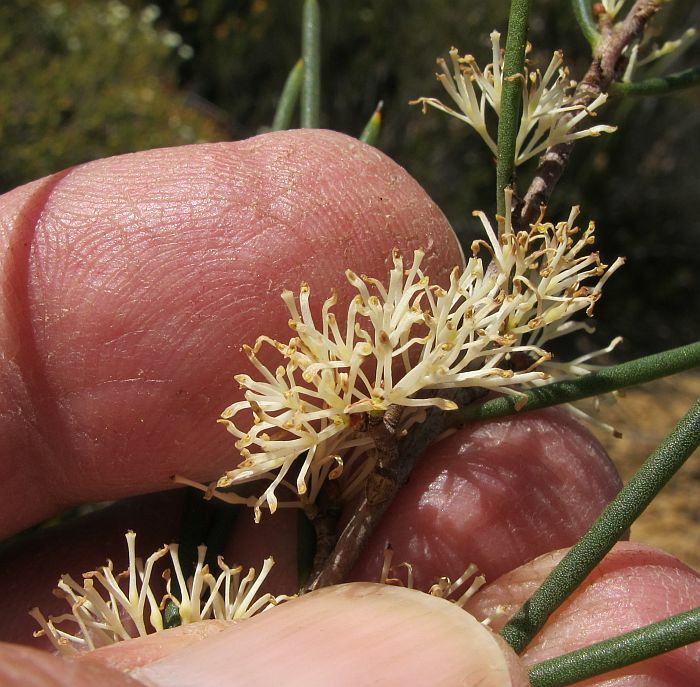 Official records place this Hakea outside the Esperance region, but it is to be found 100 km NW of Esperance, where it occurs in gravel and low-lying clay habitats. 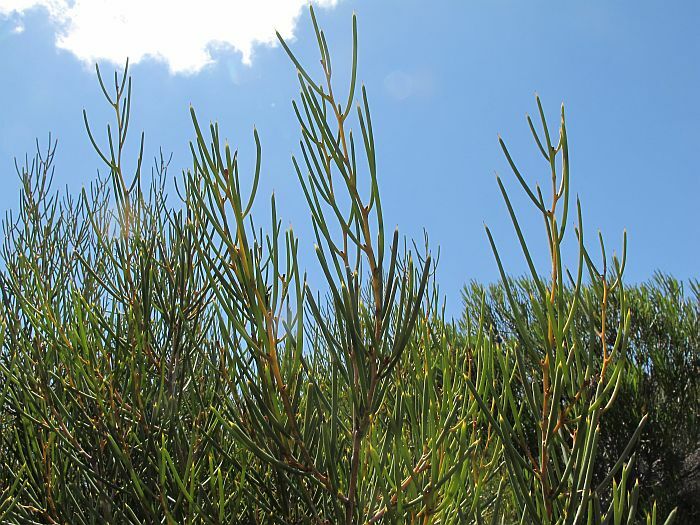 It is a bushy shrub of 2-3 metres (6’-10’) in height, with the taller shrubs growing amongst crowded Melaleuca and Eucalyptus spp., the shorter in open shrubby mallee heath in the Rollond/Neds Corner Roads region. 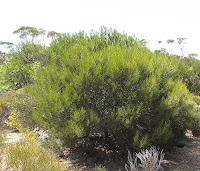 It is an inland mallee species and formally distributed between Bruce Rock (north of Albany) to the Mt. 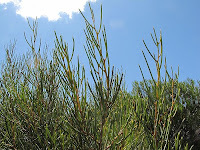 Holland region (west of Norseman) and 275 km NW of Esperance. 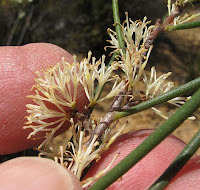 On casual observation, this species is easily confused with a couple of similar looking hakeas, namely H. obliqua subsp. 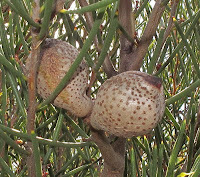 obliqua and H. scoparia. 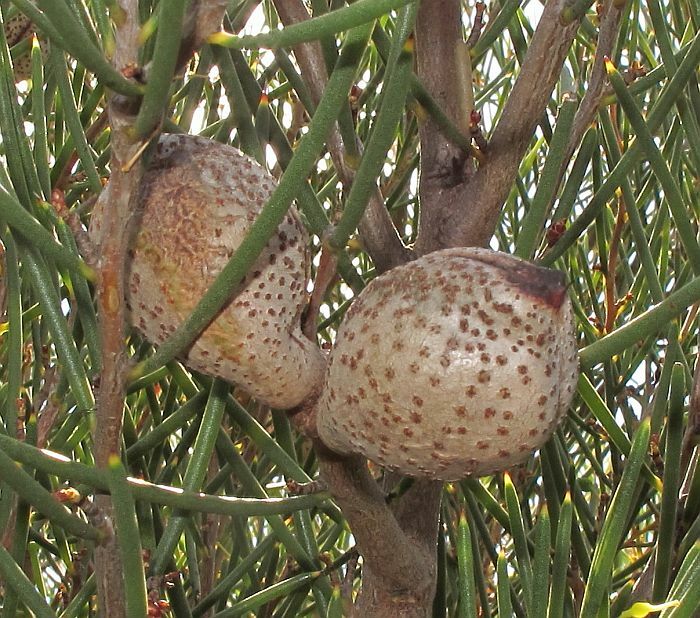 The former is more upright, but less bushy and with large corky fruits, whereas H. scoparia although similarly sized to H. newbeyana, the flowers are larger and more ornamental, plus the fruits are smaller with two distinct projections. Both these species are posted here under their botanical names in the lower right-hand column. The flowers of Hakea newbeyana are tiny, being around 4 mm (under 3/16”) in length, whereas the fruit grow to 3.5 cm x 2.5 cm (13/8”x 1”) so from little things, big things grow. 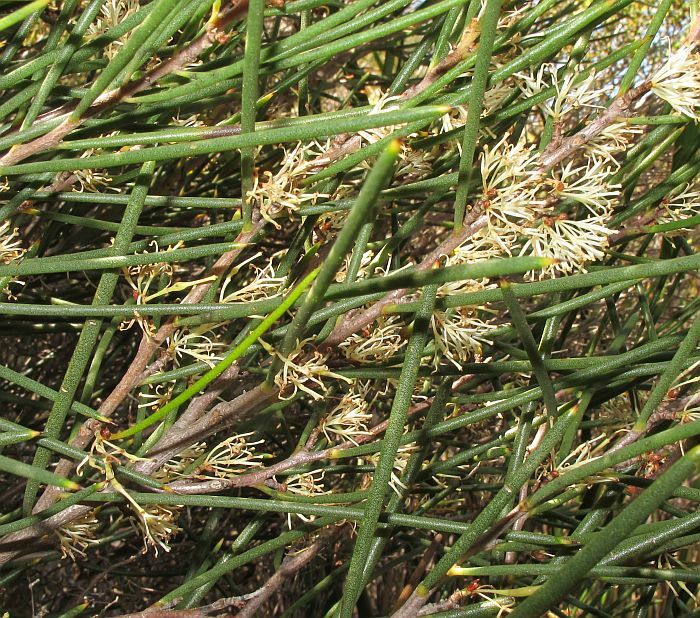 The flowers are in multiple small clusters that project from the leaf axils to provide a mass floral display, the timing of which is dependent on favourable weather conditions. 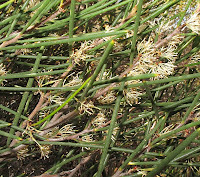 Due to the small flower size and mass blooming habit, the flowering period is quite short and normally lasts less than a month, which depending on the weather can be anytime from June to October.